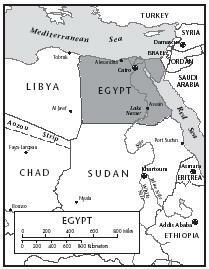 The Arab Republic of Egypt is located in the northeastern region of the African continent, bordering both the Mediterranean and Red Seas. 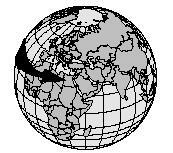 The climate is arid and dry and most of the country receives less than one inch of rainfall each year. The Mediterranean may offer Egypt's northern coastline up to eight inches of rainfall each year, and keeps year-round temperatures cooler than the inland deserts. The widespread lack of rainfall makes it extremely difficult to grow crops. Egypt has no forests and only 2 percent of the land is arable (land that can be farmed). The well-known Nile River, the longest river in the world, runs north and south through eastern Egypt and empties into the Mediterranean Sea. The Nile River Valley, which includes the capital city of Cairo, is the most fertile land in Egypt. Approximately 95 percent of the country's population lives alongside the Nile River. However, overcrowding in this region is threatening Egypt's wildlife and endangering the Nile's water supply. fish was prepared by cleaning the fish, coating the pieces with salt, and placing them the sun to dry. 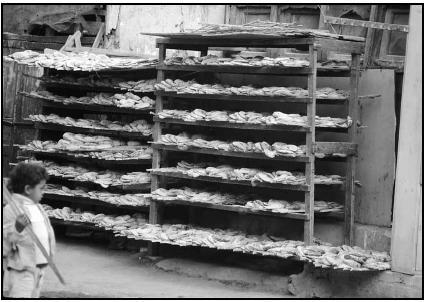 Fasieekh (salted, dried fish) remained a popular meal in Egypt as of 2000. 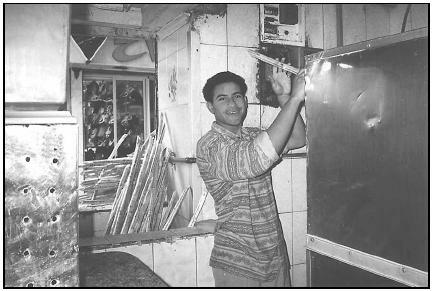 The unique Egyptian cuisine has been influenced throughout history, particularly by its neighbors from the Middle East. Persians (modern-day Iraqis), Greeks, Romans (modern-day Italians), Arabs, and Ottomans (from modern-day Turkey) first influenced Egyptian cuisine thousands of years ago. More recently, the foods of other Arabic people in the Middle East such as the Lebanese, Palestinians, Syrians, as well as some foods from Europe, have affected the Egyptian diet. However, Egyptian cuisine maintains its uniqueness. After thousands of years, rice and bread remain staple foods, and molokhiyya (a spinach-like vegetable) and ful mudammas (cooked, creamy fava beans), a national dish, are nearly as popular as long ago. Koushari, a vegetarian dish, combines lentils, chick peas, macaroni, and rice in a tomato sauce subtly flavored with onions and garlic. It is always accompanied by pita bread. Egypt has a variety of national dishes. Ful (pronounced "fool," bean paste), tahini (sesame paste), koushari (lentils, macaroni, rice, and chickpeas), aish baladi (a pita-like bread), kofta (spicy, minced lamb), and kebab (grilled lamb pieces) are the most popular. Prepare lentils: Place the lentils in a sieve and rinse thoroughly. Place them in a large saucepan with 3 cups of water and 1 teaspoon salt. Heat until the water begins to boil. Lower the heat, and simmer for about 1 hour until lentils are tender. Drain and set the lentils aside. Prepare the macaroni: Fill the same saucepan with water (add salt if desired). Heat until the water begins to boil. Prepare the rice: Heat the 2 Tablespoons of olive oil in the same saucepan. Add the rice and cook for 2 or 3 minutes, thoroughly coating the rice with oil. Assemble koushari: Drain chickpeas and rinse. Add chickpeas, lentils, and macaroni to cooked rice and toss very gently with a fork. Make sauce: Peel the onions and cut them in half lengthwise. Slice each half crosswise into thin slices. Heat ¼ cup olive oil in a skillet. Add onions and cook, stirring often with a wooden spoon, until onions are golden brown. Add garlic clove and cook 1 or 2 more minutes. Stir in tomato puree and heat until bubbly. Now pour the sauce over the lentil mixture and heat over very low heat for about 5 minutes, until completely warm. Aish , the Arabic name for bread, means "life." It accompanies most meals and is served in various forms. The most common bread is pita, usually made with whole wheat (or sometimes white) flour. Long, skinny French-style loaves of bread are also widely eaten throughout the country. Traditional Egyptian cheeses, as well as feta imported from neighboring Greece, are frequently served alongside bread at meals. Despite the country's dry climate and shortage of arable land (land that can be farmed), Egypt grows a variety of fresh fruits. Mohz (bananas), balah (dates), burtu'aan (oranges), battiikh (melon), khukh (peaches), berkuk (plums), and 'anub (grapes) are commonly grown. Ful (creamy bean paste made from fava beans), one of the country's several national dishes, is a typical breakfast meal. It is often served in a spicy sauce, topped with an egg. Lunch, normally served between 2 P.M. and 4 P.M. , usually includes meat or fish, rice, bread, and seasonal vegetables. Salad ( mezza, or mezze if more than one is served), topped with typical Middle Eastern fare such as olives, cheese, and nuts, may also be eaten. Meat (usually lamb, chicken, fish, rabbit, or pigeon), vegetables, and bread make up a typical dinner in Egypt. Tea and a dessert, such as baklava (honey pastry), basbousa (cream-filled cake), or konafa (cooked batter stuffed with nuts), are familiar after-dinner treats. Tea and coffee are widely consumed. Egypt's numerous coffee and teahouses brew very strong coffee and tea (often mint tea), usually offering both full of sugar. Coffeehouses are typically filled with men who gather to play dominoes or backgammon. Coffee is served saada or "bitter" (no sugar) or ziyada or "very sweet." Egyptians also enjoy a drink called sahleb, made from wheat, milk, and chopped nuts. For a typical dessert, Egyptians may serve mint tea with sugar and a sweet, flaky pastry called baklava. If using loose tea, measure 1 teaspoon of tea leaves into a teapot for each person being served. Otherwise, place one tea bag per person into the teapot. Allow to steep (soak) for about 3 minutes. If loose tea is used, allow the tea leaves to settle to the bottom of the pot, and pour carefully to avoid disturbing them. Add 4 or 5 teaspoonsful of sugar to each cup. Enjoy with a piece of baklava, purchased from a bakery. 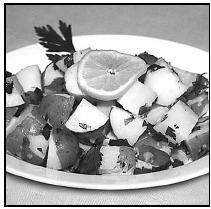 The dressing for Lemon and Garlic Potato Salad is a light and flavorful combination of lemon juice, garlic, and parsley. Cheese with bread is frequently served at meals. 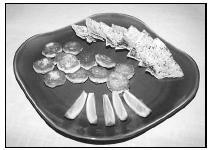 Here, oven-fried cheese, Gebna Makleyah (recipe follows), is served with lemon wedges and pita triangles. Boil potatoes until tender (½ hour to 1 hour, or until a fork can easily pierce the skin) and let cool. Add parsley, garlic cloves, lemon juice, oil, and salt and pepper; mix well. 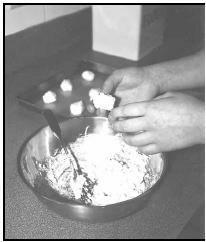 With very clean hands, shape the Gebna Makleyah cheese mixture into balls about one inch in diameter. Place the cheese, flour, egg, salt, and pepper in a bowl and mix well with very clean hands. If the mixture seems too dry, add a bit of lemon juice, vinegar, or water. Wearing an oven mitt, open the oven door and shake the cookie sheet to prevent cheese balls from sticking and to turn them. Approximately 90 percent of Egyptians are Muslims, which means they practice the religion of Islam. The most important time of the year for Muslims is a monthlong holiday called Ramadan. During the month of Ramadan (the ninth month on the Islamic calendar, usually November or December), Muslims fast (do not eat or drink) from sunrise to sunset, and think about people around the world who do not have enough food. Muslim families will often come together to prepare hearty meals, including a variety of sweets, after sunset. Muslims end Ramadan with a three-day celebration called Eid al-Fitr. Eid al-Adha, a three-day long "great feast," is another important holiday for Muslims. In recognition of the Bible story of Abraham's sacrifice of his son, Jacob, families will sacrifice (kill) a sheep or a lamb. The animal is slaughtered and cooked whole on a spit over an open fire, and some of the meat is usually given to poorer families. These animals are also sacrificed on other important occasions, such as births, deaths, or marriages. A bakery displays loaves of bread on racks. Throughout the year, several moulids may take place. A moulid is a day (or as long as a week) celebrating the birthday of a local saint or holy person. Several events take place during this time. Food stands decorating the town's streets are usually set up near the holy person's tomb. Cairo, the capital of Egypt, celebrates at least three moulids every year. The largest moulid, Moulid el Nabit, commemorates the birthday of Muhammad and takes place in Cairo in early August. Just under 10 percent of Egypt's population are Christians, whose most important holiday is Easter, falling in either March or April. It is common for families to come together to share a hearty meal, much as Christians worldwide do. Egyptian Christians observe the Orthodox calendar, which places Christmas on January 7 each year. Wash the okra and pat it dry with paper towels. Discard any blemished or hard pods. Heat the olive oil in a heavy saucepan and sauté the okra in the oil for 3 to 5 minutes, turning each pod once. Add the honey, salt, pepper, lemon juice, and water. Cover, lower the heat, and simmer for 15 minutes, adding more water if necessary. Place the cinnamon and sugar in a small saucepan with the cold water and bring to a boil, stirring occasionally. Lower the heat and allow the mixture to simmer for 10 minutes, or until it is brownish. Remove the cinnamon sticks and pour the drink into a cup. Serve with mixed nuts sprinkled into the cup. Carefully pour the boiling water into the bowl, cover, and allow to cool to room temperature. Toss lettuce with orange juice. Dining customs vary throughout the country and between different religions. When guests are in the presence of Muslims (who make up approximately 90 percent of Egypt's population), there are some general guidelines one should follow. The left hand is considered unclean and should not be used for eating, feet should always been tucked under the table, and alcohol and pork should not be requested. When invited to be a guest in an Egyptian household, it is polite for guests to bring a small gift to the host, such as flowers or chocolate, to show their appreciation for the meal. Before dinner, cocktails (often nonalcoholic) are frequently served. This is a time for socializing and becoming acquainted. Mezze (salads and dips) would also be served at this time. When dinner is ready, usually between 9 P.M. and 10 P.M. , guests seat themselves and food is placed in the middle of the table. Bread will almost always accompany meals, which may include vegetables, rice dishes, soups, and meat dishes. Following dinner, guests will move into another room and enjoy coffee or mint tea. Guests should always compliment the cook. Most Egyptian peasants cannot afford a large meal. Their diet includes vegetables, lentils, and beans. Meat, which is more costly, is eaten on special occasions. Most middle-class families eat a similar diet, but add more expensive ingredients when they can afford to. All social classes, however, enjoy quick bites at Egyptian cafes or street vendors. Traditional teahouses will serve tea in tall glasses (rather than teacups) and cafes normally offer strong, sweet Turkish coffee. Street vendors sell a variety of inexpensive foods, including ful (fava beans) and koushari (a macaroni, rice, and lentil dish) as a lunchtime favorite. Vendors also sell a variety of asiir (fresh-squeezed juices) made from fruits like banana, guava, mango, pomegranate, strawberry, from sugar cane, and even hibiscus flowers. Add onions and cook, stirring with a wooden spoon, until onions are softened. Add the garlic and continue to cook for 2 minutes. Add the tomato sauce and bring to a boil. Simmer for 10 minutes on low heat. Add the spinach and water, and heat to a boil again. In Cairo, Egypt, a young vendor pushes sugarcane stalks through a commercial juice extractor. Behind him is a supply of sugarcane, cultivated on the farms of Upper (southern) Egypt. In 1999, agriculture made up approximately 16 percent of Egypt's economy, employing about one-third of all Egyptians. However, Egypt's agriculture is also contributing to the slowing of economic growth. A shortage of arable land (land that can be farmed) has become a serious problem. The lack of farmable land has caused Egyptian farmers to move to other countries. Irrigation necessary to grow its major crops, such as sugar cane, barley, wheat, corn, cotton, and rice, is also a growing problem. The Nile River is Egypt's main water source for both drinking and irrigation, and overuse could risk the country's delicate water supply. More than two thousand years ago, the Greek historian Herodotus wrote: "Egypt is the gift of the Nile." Without the Nile River, Egypt would be virtually dry and crops to prevent hunger and malnutrition could not grow. Much in part to the irrigation from the Nile River, Egypt has one of the lowest childhood malnourishment rates on the continent. About 9 percent of children younger than five were considered malnourished. APA Productions. Insight Guide: Egypt . New York: Langenscheidt Publishers, 1999. Balkwill, Richard. Food and Feasts in Ancient Egypt. New York: New Discovery, 1994. Haag, Michael. Cadogan Guide to Egypt . London: Cadogan Books, 1998. Hachten, Harva. Best of Regional African Cooking . New York: Hippocrene Books, Inc., 1998. Imeme, Sally-Anne, and Stefan Cucos, eds. Odyssey Guides: Egypt . Chicago: Passport Books, 1997. Lonely Planet: Egypt . 5 th ed. Victoria, Australia: Lonely Planet Publications Pty Ltd., 1999. Mallos, Tess. The Complete Middle East Cookbook. Boston: Tuttle, 1993. Recipes for Food and Cuisine in Egypt. [Online] Available http://touregypt.net/recipes/ (accessed January 28, 2001). This is a really good website for the thing that I am looking for. Which is Ancient Egyptian foods. I would recommend this to a lot of people. Very informative. It is good to learn something new everyday and this was a good place to do that! Thank-You. This article was very helpful to me, I'm doing a Middle East cuisine day and needed to find what food to bring representing the country of Egypt. This page had exactly what I needed. Thank you! Thanks for these recipes. I look forward to serving some of them to a group while we watch the movie Joseph & The Amazing Technicolor Dreamcoat. One correction, though. Abraham did not have a son named Jacob. The Bible story of Abraham sacrificing his son is about Abraham's son Isaac. (And he didn't actually sacrifice him; God provided a ram at the last moment.) Muslims, however, are taught that Abraham sacrificed his son Ishmael, through whom the Arabic people are descended. Thankyou so much for the above recipes I have wanted to learn a few over the last years. Correction though to Kris, while the Bible does mention Isaac, it also mentions his first son which is Ishmael and arabs descended from Abraham who descended from Adam.